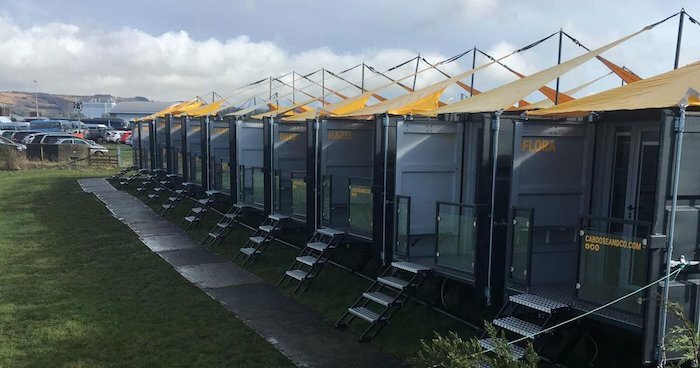 Temporary event accommodation supplier, Caboose & Co, provided a luxury 42-room temporary hotel for Cheltenham Festival racegoers from 12th-15thMarch 2019. Situated on Hunting Butts Farm, just 300 metres from Cheltenham Racecourses’ entrance, a pop-up hotel was run by Caboose & Co, responsible for unit provision, daily site management including a manned reception from 8am- 8pm, car park management, daily cleaning of the accommodation units, replenishing of fresh linen and ongoing maintenance. The company supplied 42 of its converted shipping container units, or ‘Cabooses’, offering racecourse attendees two accommodation options. ‘The Rocket’ provided two en-suite bunk rooms sleeping up to four people, whilst ‘The Scotsman’ offered a luxurious double en-suite bedroom sleeping up to two people which opens out to a large outdoor covered terrace. Each pod provided guests with plush mattresses, soft linens and towels, underfloor heating, a proper flushing toilet, hot water and electricity, a wardrobe and storage area and outside furniture. Tom Critchley, managing director at Caboose & Co comments: “We are delighted to start our 2019 event season at Cheltenham Festival, a high-end sporting event whose luxury hospitality offering is synonymous with the industry-leading standards we deliver to our customers. Cabooses will be in situ at many live events and festivals throughout the summer including Hay Festival, Download Festival, Glastonbury, CarFest North and the Royal International Air Tattoo.